As the poet once said: if you wait long enough, you reap what you saw. Knowing that she was responsible for the infamous ‘wir schaffen das’ (we’ll take care of it) when it comes to the handling of the more than 1 million asylum seekers that were allowed into the country since 2014, this must have gone through the mind of German Chancellor Ms. Angela Merkel when she read the official police report of the Chemnitz protests on Monday night. Though the initial media reporting (in German) stated that there were some 2,000 right-wing protesters carrying placards against immigrants versus 1,000 left-wing counter-protesters who were outnumbered, the official figures are far more staggering. 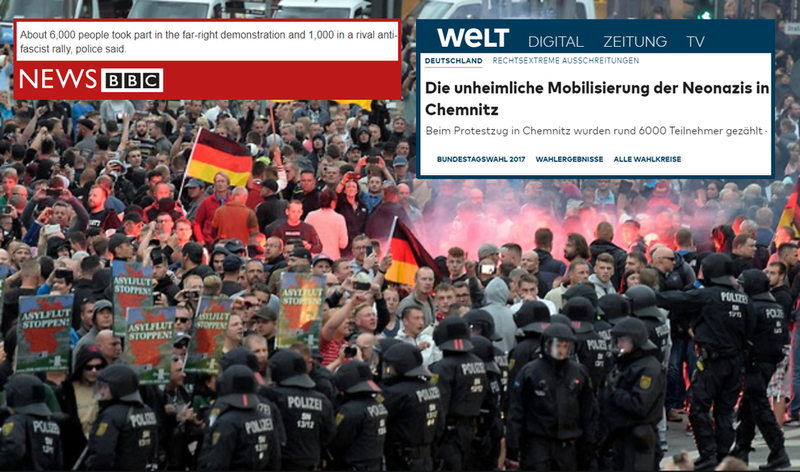 Police today admitted the right-wing groups marching through Chemnitz on Monday counted 6,000 versus 1,500 left-wing Antifa. Both groups overwhelmed the 591 police who had been called in. Related coverage: <a href="http://thegoldwater.com/news/35348-Germany-Chemnitz-Anti-Migrant-Riot-Night-Leaves-Many-Wounded-Video">Germany - Chemnitz Anti-Migrant Riot Night Leaves Many Wounded (Video)</a>. The number of wounded was 20 while the German justice system has opened at least 10 criminal investigations into right-wing protester making the ‘Nazi-salute’ which is forbidden as per German law. Several also wore swastikas (also forbidden) and as soon as security forces have identified the wearers of those, they will also face a criminal probe. Germany is shocked though the press immediately admitted that the riots would probably ‘help the AfD’ in the upcoming elections. German political analyst Mr. Werner Patzelt admitted that the expectation was that the Chemnitz protests would give more momentum to the anti-immigration party Alternative for Germany (AfD): "I fear that tensions within our society between those in favour of migration and those opposing it will be strengthened," he said, adding that the public discourse will become more "poisoned" than before. They should have wiped antifa out while they had the numbers! antifa is nothing more than a terrorist organization formed by soros and the globalist! They will be delt with eventually!